Born in Yokohama City, Minako Negishi graduated from Instrumental Music Course (Piano), Faculty of Music, Ueno Gakuen University, and completed Moscow State Conservatory Master Class. She also learned in Wein Musikseminar at University of Music and Performing Arts, Vienna. 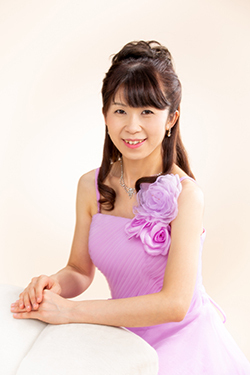 Minako Negishi started her professional career appearing in the Annual Concert by “Rookie” Musicians sponsored by the Yomiuri Shimbun. And she won prizes in various music competitions, including Jury’s Prize in Burckhardt International Music Competition, Grand Prize, Governor’s Prize, the prize of prefectural superintendent of education and the Yomiuri Shimbun Prize in the Piano Audition of Nihon Piano Association. Her broad activities include solo performances, guest pianist for the exhibition in competitions and jury in competitions and auditions. She studied under Masaki Ichikawa, Noriko Tochigi, Kumi Shimizu and Hisako Mizuno, and received lessons of Shuku Iwasaki, Yukio Miyzaki, Elena Richter, Henriette Puig-Roget, Maurizio Moretti, Avo Koyoumdjin, and Johannes Kropfitsch. Currently, Minako Negishi runs Vienna Music School. Copyright©2011 及川音楽事務所 All rights reserved.